An Israeli military court has found an 18-year-old Palestinian man guilty of the murder of a settler family in the West Bank, an army spokesman has said. Hakim Awad had confessed to murdering Udi and Ruthie Fogel, and three of their children, as they slept in their home in the Itamar settlement in March. His brother, 19-year-old Amjad Awad, is also standing trial for the attack. 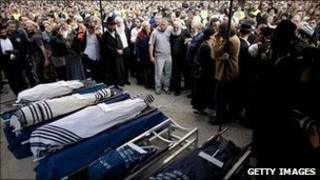 The murders shocked Israelis and were also condemned by Palestinian leaders and the international community. On Wednesday, the Shomron Military Court found Hakim Awad guilty of stabbing to death the family of five, including a three-month-old baby, on 11 March in Itamar, a settlement located some 5km (3 miles) south-east of the Palestinian city of Nablus. He was also convicted of a charge of carrying illegal weapons. It is not clear when a sentence will be handed down. In court, Hakim Awad corrected the judge on several occasions as his indictment was read out, according to Israel's Yedioth Ahronoth newspaper. He told the court that his relatives had been shocked to hear of the attack and had beaten him when they found out, it reported. But later, he said, they helped him conceal the weapons he had used, after he threatened to carry out another murder, it added. The charge sheet states that Hakim Awad and Amjad Awad acted of their own free will, although they also belong to the Popular Front for the Liberation of Palestine (PFLP), a radical group which has carried out attacks on Israelis in the past. The two men were alleged to have travelled from their village, Awarta, after dark on the night of the attack, cutting their way through Itamar's security fence and stealing an M-16 assault rifle and ammunition from an empty house. At the Fogel home, two children - Yoav, 11 and Elad, four - were stabbed and killed after being seen in the window. Parents Udi, 37, and Ruthie, 36, were next to die, stabbed and killed despite a struggle in their bedroom. Ruthie was also shot, the Haaretz newspaper reported. In the weeks following the murders, Israeli security forces arrested dozens of suspects. A hearing from Amjad Awad is expected to be held later this month. He is also reported to have confessed to the murders. Palestinian Authority President Mahmoud Abbas called those behind the killings "immoral and inhuman".